I didn't realize how long it had been since I'd written a new blog post until I logged into Blogger and saw the unpublished drafts, the posts waiting for good photos, all the aborted ideas that almost became content for the blog and just...well...didn't. "Use Wordpress," they say. "Blog posts write themselves on Wordpress," they say. Man alive it's been a busy fall! Most of you follow Lipstick & Gelato via Instagram. You'll probably have seen that I spent the last couple weeks in Ireland! It was a family trip - just three siblings and a sister-in-law roving around the island together. Ireland fully lives up to the hype: it is just as beautiful as everybody says it is. And for a country that has loomed large in legend and song and my own imagination, that's definitely saying something. I'll be writing up at least one post full of all the Ireland photos and stories, so never you fear. But today, I wanted to share a quick recipe for a one-stop dinner straight out of Yottam Ottolenghi's newest cookbook, SIMPLE. I'm one of those really bad people who step into Barnes & Noble to get a hands-on look at new cookbooks I've been craving, then order the book on Amazon right then and there IN store. If it was a small book shop I'd feel guilty about bowing to a huge corporation but when we're pitting B&N against Amazon....which one gives me free shipping and the excitement of a package on my doorstep? But if I'm 100% honest, my sins don't stop there. This time of year I not only don't buy the cookbook from B&N....I don't buy it at all. You can't just ruin possible Christmas presents from other people that way, you know. Instead, I take photos of the recipes that absolutely call my name, and I don't know but that's probably illegal or something. 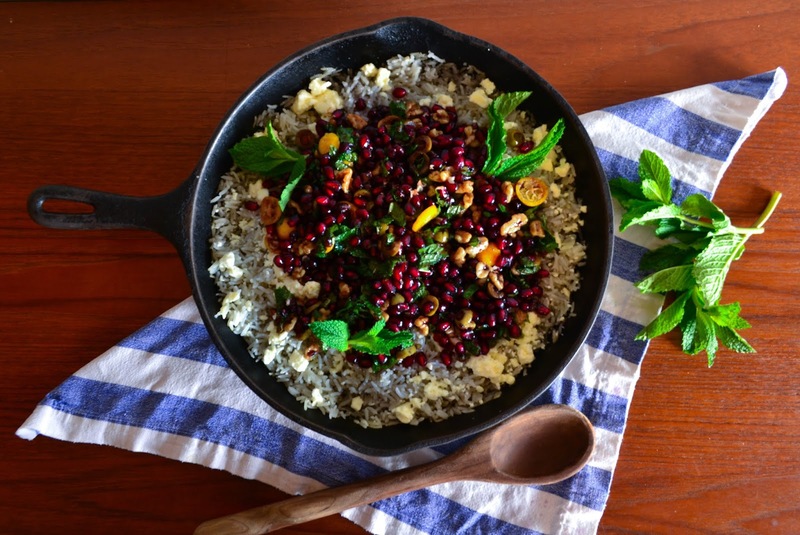 I mean, I'm still giving Ottolenghi full credit for this incredible baked mint rice with pomegranate and olive salsa. I take credit for the idea of adding sliced kumquats to the savory-sweet salsa but that's it. Today's photos aren't that great and I do apologize. The truth is, I was really in a hurry to eat the rice while it was still hot and as soon as I assumed I had enough photos in focus, I was off to the best corner of my couch with a bowl full of Ottolenghi goodness and that was it for me. It turns out that 80% of the photos were too blurry or unfocused to use so that happened. Make this dish and you'll understand my eagerness. There are two magnificent things about this rice dish. The first is flavor! Winter can be a portion of the year when it seems like wild-alive flavors have flown south, but not tonight. There has never been a single instance where I made an Ottolenghi recipe and was anything but bowled over by how great the end result tasted. The whole beauty of Ottolenghi's creations is in their simplicity; just really good ingredients arranged in simple ways to create delicious meals. You can technically make this dish using just one pan for baking and serving the rice and one small bowl for mixing the salsa in - dinner dishes who? 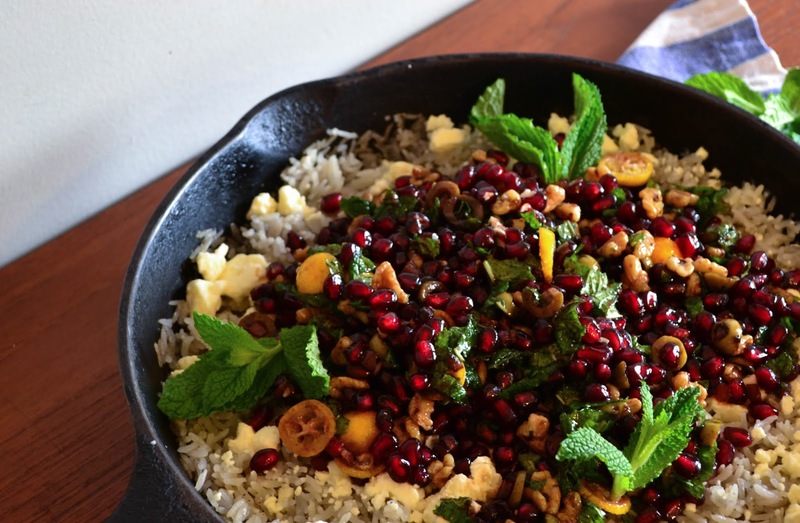 The second beautiful thing about Ottolenghi's baked mint rice with pomegranate and olive salsa is how freaking glamorous and Christmas-like it looks. Between the evergreen-colored mint and pine-like olives, the deep red pomegranate arils, the almost-silver cast of the herb-baked rice and the bright pops of gold from sliced kumquat...y'all I'm for real: I almost wanted to hang the whole darn skillet on our tree and call it decorated. And for all you busy families, this is a dinner that can be on the table in half an hour. I'm completely serious. Pomegranates and kumquats are in season, rice is my new best friend, and Christmas was invented for the flavor of mint. Dive right in - Yottam Ottolenghi says it's simple, and he's the only human (besides my mom) who is basically never wrong. Preheat oven to 475 degrees F. or as high as your oven will go. 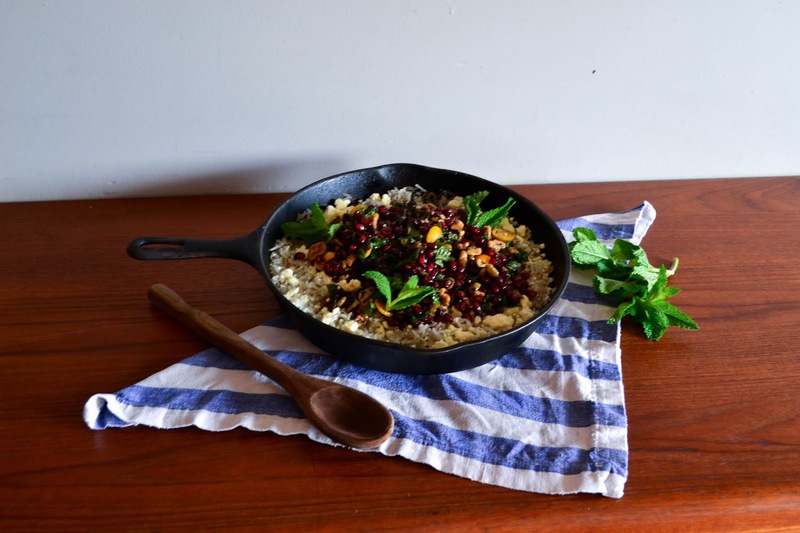 Pour the uncooked rice into a large baking dish or cast iron skillet. Season liberally with salt and pepper. Add melted butter and boiling water, then arrange mint sprigs on top of rice and cover pan tightly with foil. Bake for 25 minutes without disturbing till the rice is cooked and all water has been absorbed. Discard mint sprigs and top with feta cheese and salsa. While rice is baking, mix together the ingredients for the salsa in a small bowl. When rice is finished baking, fluff with fork and scatter feta cheese on top. Just before serving, spoon salsa over rice. For most intense flavor experience, serve rice immediately. YUM YUM YUM BLESS YOU FOR ALL THESE RECIPES!